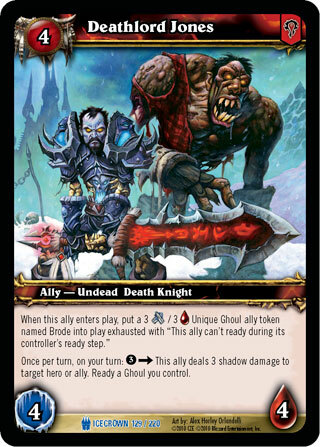 Rules: When this ally enters play, put a 3 [Melee] / 3 [Health] Unique Ghoul ally token named Brode into play exhausted with "This ally can't ready during its controller's ready step. ";Once per turn, on your turn: 3 -> This ally deals 3 shadow damage to target hero or ally. Ready a Ghoul you control.